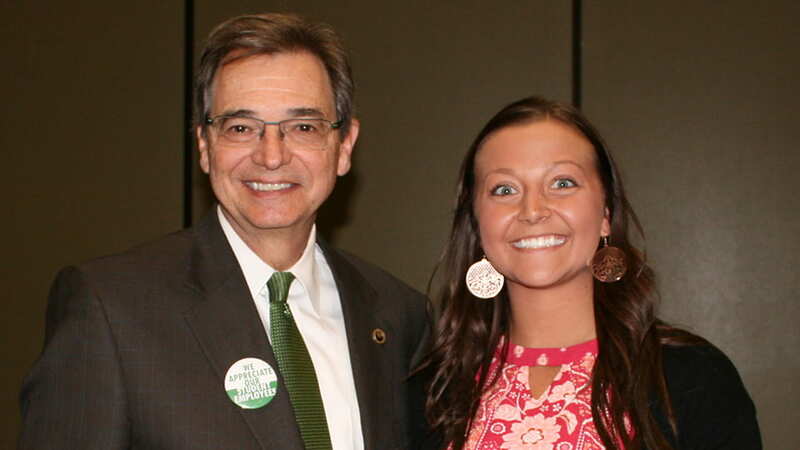 Congratulations to Lexi Kinnard, named UW-Green Bay’s student employee of the year at a recognition ceremony on Monday (April 10, 2017). Kinnard works as the lead student building supervisor for the Kress Events Center, and was nominated by Tim Helein. Lexi is responsible for building supervision nights, weekends and when professional staff are not present. Her duties include direct supervision of student employees, scheduling and training. She is able to manage all components of the Kress Center including membership and guest relations. Helein had this to say about Kinnard, “Any expectations I have of Lexi would not equal the expectations she has placed upon herself. The personal ownership and initiative that Lexi applies to her work and her life by getting involved in a variety of ways exemplifies her dedication and desire to succeed.” Watch for more on the event and the other nominees and award winners in a future Log. This entry was posted in News and tagged Financial Aid, Kress Center, student employee appreciation week, Student Employee of the Year on April 10, 2017 by Sue Bodilly.